In this section, we will add simple AI-controlled enemies to the game. These enemies will patrol their platform randomly until the player comes nearby. When that happens, they will chase the player to inflict damage on collision. If the player escapes, they will go back to patrolling. 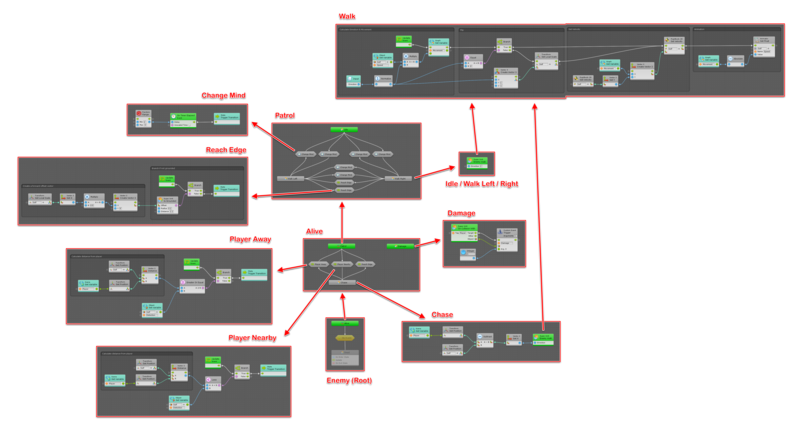 Fair warning: this section is the hardest part of the tutorial and will require the combined use of every skill we've learned so far: flow graphs, state graphs, super units, transitions, macros, custom events and variables. Make sure you understand every previous section before starting, because now that the concepts have been introduced, we will go a bit faster than usual. Take a short break, stretch your legs, and when you're ready, let's get started! Alive: When the enemy is alive most of the logic happens, like patrolling, chasing and damaging. For the first time, this state will be a super state, meaning it will itself be contain a state graph. 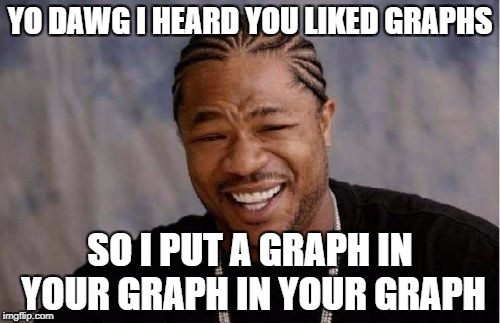 Previously, we only used flow states, where the child graph was a flow graph. Dead: When the enemy is killed, it should slowly spin downwards then disappear. This will be a simple flow state that we will implement in the next section, when we add projectiles to kill enemies. Add a transition from Alive to Dead. Chase: When the player is nearby, the enemy chases it. This will be a regular flow state. Damage: In parallel to patrol and chase, the enemy can inflict damage when colliding with the player. This will be a regular flow state as well. Parallel here means that there will be two "systems" of states in the alive state graph that will run at the same time: one for movement (Patrol or Chase), and one for damage (just one state). To do that, we only have to define multiple start states: a powerful feature unique to Bolt. Our two start states will be Patrol and Chase. Inflicting damage to the player is really easy now that we have already created all the health system in the previous section. As a reminder, we added a Damage custom event to the PlayerHealth state graph that took one argument: the amount of damage inflicted. Notice how keeping our graphs DRY and organized made this very simple: the collision code is fully handled on its own, and the player is responsible for its own health and damage system. The enemy, a separate entity, only has to trigger a single event. This is an example of how nesting and events in Bolt allow you to create a robust game architecture. Let's take a moment to plan ahead: we know our enemy has to walk in multiple places. It has to walk left and right when patrolling a platform, and walk towards a player when chasing. That's 3 places already we're we'll need a walking graph. At this point, you should see where this is going: we'll keep everything DRY and create a reusable macro! Create a new flow macro asset called EnemyWalk. This graph will be similar to movement on the player, but not exactly the same. This direction input represents a X axis value. Like we did for the player earlier, we'll flip the enemy sprite by setting the X axis of the scale equal to the direction, but only if the direction isn't zero. If it is zero, meaning the enemy is idle, we'll skip flipping altogether and keep the last scale. Now that we have our walking macro ready, we can implement patrol. Idle: When the enemy is idle and waiting. It adds a bit of realism to have it "sit and think"! We will now add use our EnemyWalk macro as a super unit in each of these states. Delete every event in each state and drag & drop our macro to create the super unit. Next up, we will create the transitions between these states. Sometimes, the enemy should randomly change its mind about where it's going. It might be idle and decide to walk, or change direction, or stop walking. We will call this the "change mind" transition, and we'll create a single reusable macro to handle all of them. This simple transition randomly waits between 1 and 3 seconds to trigger. That's it! If you test now, the enemy should start patrolling randomly... but it won't stop when it reaches the edge of its platform! Let's fix that by adding another type of transition when the enemy reaches the edge of its platform. If that ground check with an offset returns false, we'll know that the enemy soon won't be grounded, and therefore has reached the edge of its platform. We could leave radius and distance at constants, but while we're at it, why not turn them into arguments to make our macro really flexible? Then, we'll need to calculate the offset parameter so that it points in the direction the enemy is facing. We can use the X axis of the scale to know that, because we flip the enemy in our movement code. We then multiply it by 0.5 units forward, which is a small offset of about half the enemy's width. When chasing, the enemy should walk towards the player. Thanks to our EnemyWalk macro, this is fairly easy: we only need to calculate the direction from the enemy to the player and pass it to the super unit. The enemy should start chasing the player when it gets nearby, and stop when it escapes. Tip: You can copy-paste everything from the Player Nearby transition, right-click Less and choose Replace, then pick Greater Or Equal instead. If you test your game now, you'll see that the enemy does chase the player when it gets near... but even if that means falling off the ledge! You got through the hardest part! Congratulations! At this point, your enemy should patrol the platform, chase the player when it gets near, and inflict damage on collision. Hi just one small point - in 2. Alive State the recap should be "2. Add a flow state called Chase"
Hi again - on recapping this section I there's something I don't understand. In the Patrol logic, how does Bolt decide which state to transition to if the Change Mind random timers pick the same value? E.g. Enemy is in Idle state, so there's two possible transitions >Walk Left or >Walk Right, each controlled by the same logic. If both timers pick the same value at the same time which transition takes precedence? Or, do we presume that because they're floats, the chances are too small to worry about? Or am I missing something else...? The value of the timer gets picked when the parent state is entered. The lowest value of all transitions will be triggered first, and all other transitions will be ignored after. If they both pick the exact same value (which is highly improbable), there is unspecified behaviour, meaning either of them could get traversed, and Bolt doesn't define or guarantee an order. Transitions have no notion of priority, they're all checked simultaneously. However in this case it doesn't matter at all, because both decisions would be adequate. As for the last transition, I'm puzzled because it worked when I tested it (but yes, there's a transition loop; we're just being lazy to be honest!). I'll give it another look when I have a minute. I tweaked the PlayerNearby transition to include a ground check. This worked reasonably well. That indeed help to improve it. Not ideal but definitely better. I extended the graph that checks for the ground to also return the object that triggered the collision. Then I added an object variable to store the output of that as the CurrentPlatform when that ground check is being made. Then before I let the enemy chase, I check to see if they are on the same platform. This seemed to work and then they also should continue patrolling and not get stuck on the edge. Set the enemy's damage value to 0, and make the player stand on the edge of the foundation. Then the enemy falls off the edge. I believe that two transitions "Player Away" and "ReachEdge" will not be evaluated at the same time. It is dangerous to set up multiple transitions. Even just standing at the edge, the enemy dropped. On 4.2 Flip, my enemy flip is scaling the object by the speed variable. if i set it to 2, enemy will scale by 2, if speed variable is 3; enemy scale X will be 3. I've checked all the nodes and nothing seems wrong. Are you sure you used the Normalize unit? I get the error "state transition trigger cannot be used outside a state transition." when I try to play now. (once) I've been following this to the T and I don't see a rogue state transition trigger anywhere. Any ideas? It highlights the enemy when I select the error in console. Having the same issue here. Did you find what was wrong? You need to add the transition the same way as under "5.1 Change mind transitions". You need to use the Graph Inspector to change the source of the transition to "Macro" and then choose "EnemyReachEdge". Same way as under "5.1 Change mind transitions". If you added the EnemyChangeMind and EnemyWalk macros as components of the Enemy you will get errors like "state transition trigger cannot be used outside a state transition." Remove those components and your errors should disappear. I had the same problem! I noticed I accidentally put EnemyWalk Super Unit into each transition instead of using the correct macro, "EnemyChangeMind". "You'll notice that this time the Equal unit takes numbers and allows for an inline value for B. This is because Numeric is checked in the graph inspector for the unit:"
the enemy is flipping like crazy due the the value in coming from the Get X node is flipping ? the distance values going into the node don;t add up they should be much different since the player is so far away from the Enemy ? When you add a Super Unit to a Flow Graph or Super State it should show this. EG if I add a Fixed Update to Damage (Damage being a Flow Graph it shows but not any other objects like Super Unit. It would also be great you could right click on jump to a Macro or State Machine file. As the project gets bigger you want to be able to do this. But like Right click in Visual Studio and say jump to a function that could live in another class file. I had to declare a new scene variable in Level 3 otherwise the the Get Variable > Player for Player Nearby threw an error - it could not find the variable declared in Level 1. I think this is a change in the latest version of Bolt which cannot reference scene variables from other scenes. Is the better solution to create an application variable for all scenes? I am having trouble at 6.1 - I have created the 2 transitions 'Player Away' and 'Player Nearby'. I made sure to use the get Application variable (and not scene as shown in tut) for both transition. If I play the scene, and watch the transition graph, it works well (finds the player and its position, compares it to the self position of the enemy... but as soon as 'Less' comparison returns true, I get the following error: "InvalidOperationException: Variable not found: 'Player'. Bolt.VariableDeclarations.Get (System.String variable)." Never mind... I had kept the Player var as a scene variable in the Chase state... my bad. I honestly feel stupid for this, but the collision between enemy and player isn't triggering for me in the end of Step 3, am I missing something here? It's triggering the Damage event in the enemies State Flow, but not actually taking health from the player, am I missing a piece somewhere? hi please be sure that your Player is in Player layer and Enemy in Enemy layer, when the collusion occurs. Because you may change the layer of the player to Playerinvincible by code before and because of the bug in the code it doesn't return to Player layer again. Hello. I have a little problem. When i'm at the edge of one platform, and the monster is at the edge of the other, (the chase program is enable) the enemy is terribly flipping, and ignore the edge. I looked all my codes, and all is good. How can i fix that ? Thanks for your help ! I don't understand why my EnemyWalk macro don't turn Super unit. Hi jussi, how did you solve the EnemyWalk graph input cannot be used outside super input problem? Your final quick-fix works but in a kinda weird way. when my character hits the enemy nothing happens? I had this issue, and it solved it. Fun debugging experience anyways. Thanks for this fix, it solved my problem. This makes sense too. Correct me if I’m wrong. Running on my i9 workstation the framerate is fast enough that it processes the commands multiple times in a single frame. The fixed event forces the command to instantiate only once per frame. At first, I couldn't get why, once the enemy flips and its relative ray cast is also flipped, the branch value still returns false, which creates our loop. But if the false event still exists because you are in the same frame then you do have a potential loop. This raises more questions in terms of best practices with Bolt, given optimal efficiency within the range of older/slower systems and more powerful setups. Much more to learn, but you do have an amazing product sir. enough that it processes the commands multiple times in a single frame. Thanks for that ! My character kept falling and something was up and this fixed it. Thx. I have an issue, which I assume everyone else doing this tutorial are having too. Is there some alternative way to replace the now obsolete On Timer Elapsed unit? Or some way to stop the On Enter State coroutine when the state it transitions from is exited through another transition? I noticed there are some units to stop coroutines but no way to reference the On Enter State coroutine. Hope that is clear and would welcome any suggestions. Thanks. Your sample is very useful. I was testing with "start" and "enable". As you pointed out, there is a coroutine problem. I am a beginner, so try improving by referring to your sample. I am poor at English, so I use Google translation. I am sorry if it was a funny sentence. I get an error in step 3. When I hit an enemy the error "MissingValuePortInputException: Missing input value for 'a'." occurs. On collision a heart disappears and the health variable of the player decreases by 1. But there is no hurt animation. In play mode after collison, the Alive, Damage and the Custon Event Trigger turn red in the flow graph. Besides there is no change in the layer visible (Player layer to PlayerInvincible) when I touch the enemy. I ended up using the On Enter State unit (as a coroutine) for starting the Wait For Seconds timer, and an On Exit State unit connected to Stop All Coroutines. It works but I'm not sure if it's the best way to do this. Hey, i´v got a problem at 4.1 . I´m using tthis tutorial to script my own game. I scaled my enemy to 0.14 instead of 1. So when i hit Play, my enemy scales up when i use the script of the tutorial. I fixed it on the Y Axis, so it only scale up on the X Axis.. But i don´t know how and where i can fix it. As you can see, the X node of Vector3 is connected with "normalize" and "input". Is there a possibility to change the X Axis from 1 to 0.14? Another problem. i´ve got an error in my console and it says : state transition trigger cannot be used outside a state transition. I can´t find the mistake. Took a swing at it. I went ahead and did it in Bolt 2, so that I could show the generated code along side of the graph. Working in Bolt 1.4, your graph will have a horizontal graph, and the look of the nodes will be a bit different, but the nodes used will be the same. Note that the Custom Event has been marked as a coroutine, so Bolt will trigger it as a coroutine behind the scenes (and thus, why the yield returns don't result in compilation errors). It doesn't show the setup and tear down of the Unity coroutine structure in the generated code, but it functions the same. If this is more confusing than helpful, just let me know and I'll run it through version 1.4 instead. I thought the code gen might help you follow it. Thanx a many. This graph works. You have been a great help to me. So kind of you to send the solution at the earliest. i tested the graph at my end, it works according to my requirement. You are simple great. THANKS once again. I'm fairly new to visual scripting so I may be missing some debugging and general skills. But I've been following this tutorial and things have been going well so far, other than having to look up how to replace some of the events that are no longer supported (i.e. On Timer Elapsed being deprecated). But now I'm at the enemy detecting edge part and my enemy character just walks to the edge and gets stuck, keeps walking in place, and does not switch directions. I've double checked my flow and gone back and re-read the instructions but can't find out where I went wrong. I tried adding debug logs to the offset to make sure it's getting set correctly and that looks okay. Any tips for debugging the raycast? Or ideas in general on how to debug this? Thanks! I found an earlier comment from Антон Орлов that fixed the problem for me! It seems both transitions were firing at the same time. I changed it from "Update" to "Fixed Update" in my reached edge transitions and it resolved the issue. Thanks! Works now! thanks a lot Brian for sharing, i was about to just quit this;) Why is the tutorial not updated a bit?...i lost a ton of time trying all kind of thing. I haven't found a solution to the problem and although it does appear to work, I don't think fixed update is the right fix. Maybe fixedupdate is the right place to do it, but shouldn't anywhere GroundCheck is being called also be in a fixed update?